Soon and very soon, you’re going to see a new site. Hallelujah, hallelujah! There’s going to be a new site. No more Blogger here, there’s going to be a new site. No more crying here, there’s going to be a new site. WordPress will be here, there’s going to be a new site. Hallelujah, hallelujah! There’s going to be a new site! Soon and very soon, we are going to see the King. Hallelujah – Hallelujah – We’re going to see the King. No more cryin’ there, we are going to see the King. 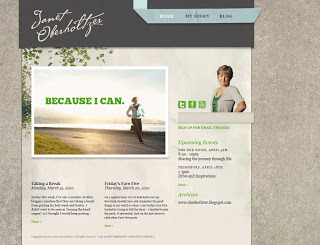 Nice layout Janet. Clean. I like the silhouette treatment of you. Makes you look powerful. I love the look of the new website! It looks like you found a really great creative group to create a site that really feels like you.